Abelson, Fiscal Stimulus, Bridgewater, Nicholas Kristof and Women! The stimulus package. I know we must spend money to help the tumbling economy, and actually I just heard over my shoulder on CNN President Obama say ‘it is only the government that can break the cycle” of this downward spirally economy, but I am deeply worried about how wasteful this package has the potential to be. We are spending our future. Let’s be clear about this. We are borrowing from tomorrow, from future revenues, to try to make things better today. There is no free lunch. I am saving the best for last. 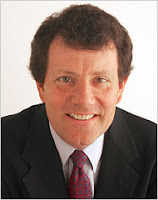 I cannot begin to tell you how many people forwarded me this piece by Nicolas Kristof (pictured) called “Mistresses of the Universe.” You go Nic!!!! I could not agree more. Of note is that together with the National Council for Research on Women we are about to release a paper on exactly this topic!!! This has been a three year project and we are beyond excited about it. The question we asked? Why are there not more women in professional trading and portfolio management roles? We can stretch that even further and ask why is that women do not more equally share in power and decision making? If you are a regular reader you KNOW that I completely believe that we need a world where women and men more equally share in power. So much so that last night I actually dreamt about it. In my sleep I was asking myself this question. Why is it NOW that women are going claim their space as leaders and decision makers? Why now? In the middle of the night I woke up, grabbed a piece of paper, and wrote this – “Because we are ready. We are ready.” I swear with my hand on the hotel bible that this happened. I know it, in my bones, that women are ready to be part of the solution. Women are ready to be major players in this world, to work collectively with good men to make this world a better place. How do we do this? “By doing what we can, with what we have, where we are” ….. then doing more. At the end of the day however it is about women being in places we need to be in critical mass. It is only then that we will know what women’s leadership and women’s led solutions look like. Thank you Nicholas for all your brilliant writing on topics that deeply matter to me. Might this be one of many factors contributing to what is wrong with Wall Street leadership today? Arguably at this moment of financial and economic crisis, after approximately $10 trillion dollars of global wealth has vanished, women remain virtually absent at the decision-making tables that count. For all those men who sat around thinking they were the “smartest guys in the room”, is it not time to ask “what could we have done differently?” Could the difference possibly have been a critical mass of women? We will never know. Sure you can name a couple of women, but that is just it, a couple? It takes critical mass to know what women’s presence and leadership looks and feels like, and we could sure use that data right about now. Don’t call Goldman looking for that information though as they do not have it. My piece Brokenness, Hope and Women from HUFFPO on the topic as well. This may be my last post for a few days and there are so many things I want to write I think my head is going to explode. I am going to spend some quality time with my 8 year old daughter Allie and then attend the Womens Funding Network board meeting here…. Previous Post It is ALL about PEACE!!! Next Post Feeling Down? Volunteer. Yee-hah! The message is getting out! As I sit here having my morning tea, I am watching Nicholas Kristof on “Good Morning America.” Claire Shipman’s piece is called “Would We Be Better Off if Women Were in Charge?”. . .
Keep on keepin’ on, sister!